Computer vision syndrome is a group of problems affecting the eyes that result from extended use of computers, smartphones and other digital devices. Also called digital eye strain, computer vision syndrome is becoming more prevalent as people spend so much time looking at digital screens, which make the eyes work much harder than they do with other types of reading or writing tasks. The entire team at Laser Eye Center of Miami cares about the eye health and vision of our patients. In this post, we share a few ways to protect yourself from developing computer vision syndrome problems. Protecting yourself from computer vision syndrome often starts with adjusting how you sit and look at your screen. Experts say you should position your screen so it is about 20 to 28 inches from your eyes. You should also sit with your computer slightly below eye level, as it is typically more comfortable to look at the screen when the eyes are looking downward. Adjust your chair height so you are sitting with your feet flat on the floor. Adjust your chair arms so they provide some support while you type. And avoid resting your wrists on the keyboard as you type. The presence of glare or reflections on the screen can make it even more challenging to look at a computer screen. Adjust your computer screen to minimize glare from overhead lighting or nearby windows. You can also look into using a screen glare filter to cut down on the amount of light that is reflected from the screen. Even minor uncorrected vision problems can significantly contribute to the likelihood of developing computer vision syndrome. If you wear glasses or contacts, see your ophthalmologist or optometrist regularly to ensure your prescription is current. Ask your doctor if you may benefit from different lenses with special lens powers, tints or coatings for computer viewing. If you are around the age of 40 or older, you may have developed presbyopia, or the age-related loss of reading vision, and should look into wearing reading glasses. Finally, give your eyes frequent breaks from looking at digital screens to refocus and avoid fatigue. Every 20 minutes of computer work, look at an object about 20 feet away for approximately 20 seconds. And every two hours of computer work, take a 15-minute break. 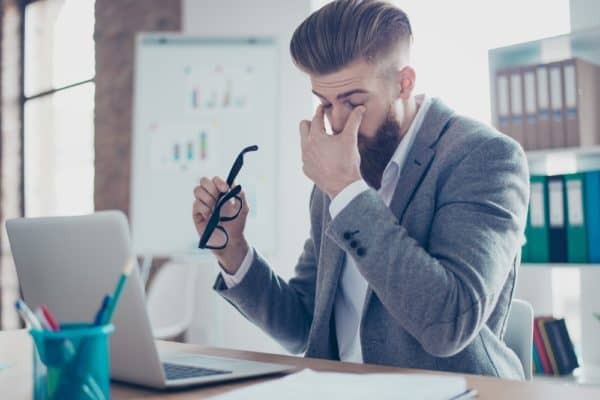 If you are experiencing symptoms of computer vision syndrome, including eyestrain, dry eyes, blurry vision or headaches, our doctors can provide additional tips to make you more comfortable. Please call or email Laser Eye Center of Miami to make an appointment with our team. Will You Need Reading Glasses after LASIK Surgery?